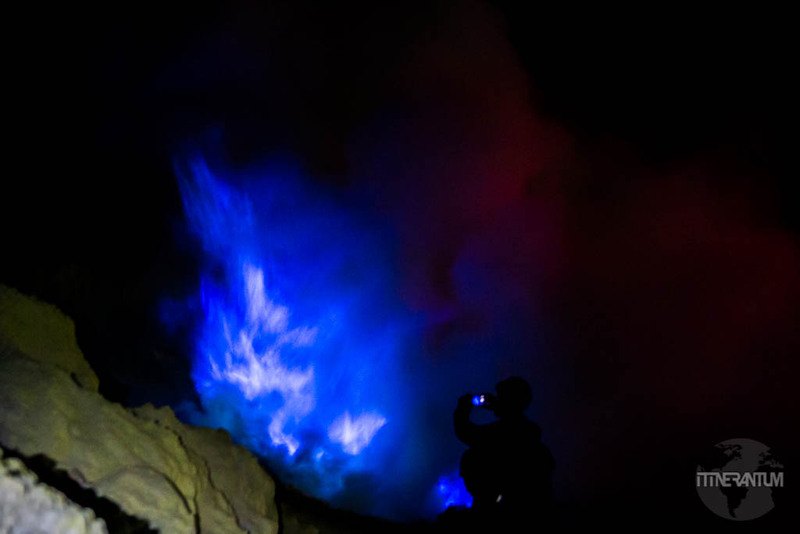 First time I heard about the Mount Ijen blue fire was when I was doing research for our trip to Indonesia. When I saw the pictures there was no doubt in my mind that our itinerary should include this breathtaking, surreal place. Yes, it can be very dangerous but this is why it’s so fascinating. 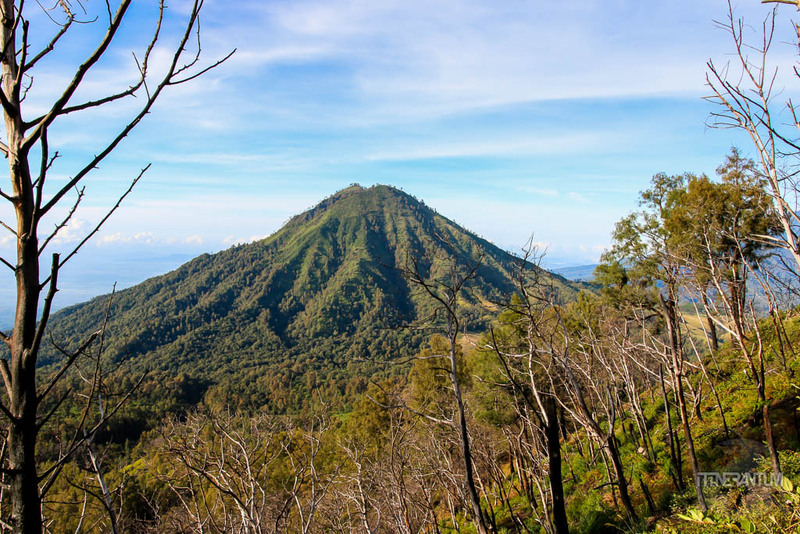 We were planning to cross the Island of Java traveling from Jakarta to Bali, but how to do it in order to include Mount Ijen and Mount Bromo, it was still a challenge. Of course, the time was limited and there are so many things to do and see in Java. So the most obvious solution, one that would save us at least 3 days of traveling and a lot of hassle, was to book a tour. While we are typically not big supporters of tours, this one seemed really convenient, taking us from Malang (East Java) to Banyuwangi, in order to catch the ferry from Ketapang to Gilimanuk in Bali. 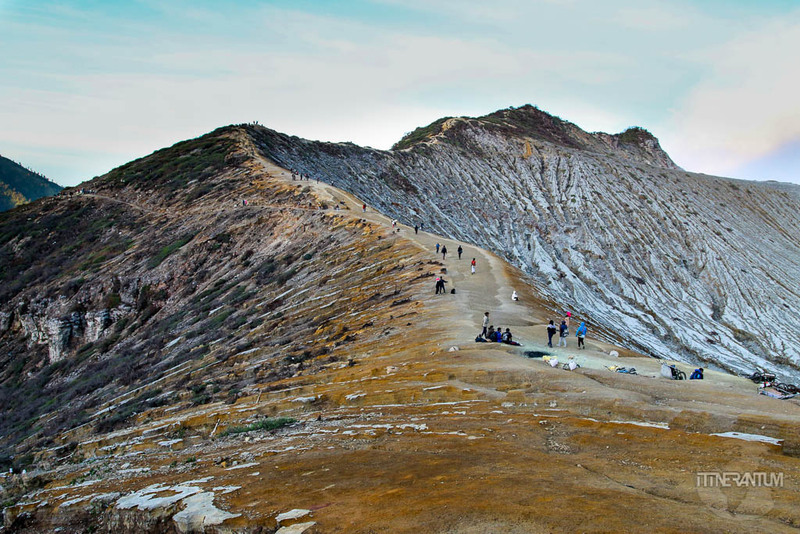 So we got to see and hike both Bromo and Ijen with only one overnight. Our detailed Java itinerary will probably be described in a different article soon. 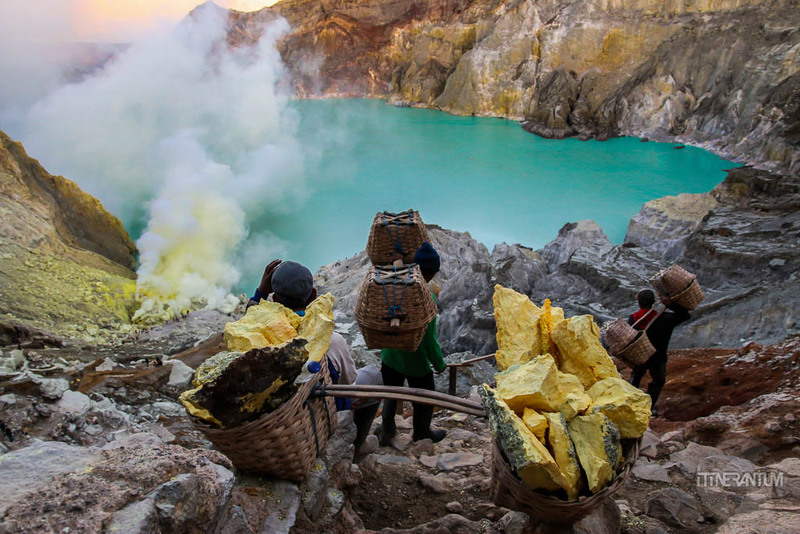 I will skip the spectacular Mount Bromo for now, and start showing you why seeing the blue fire at Ijen Crater is such a unique experience, a definitely MUST SEE if you visit Java or even Bali. While the first option requires no special guiding and is relatively safe, the second one needs a bit more preparation and information. If you want to see the blue fire your alarm will go off around midnight as you need to fuel up with some carbs and a strong coffee and try to be at the gate to start the trek around 2AM. Otherwise, 4AM is fine, if you only want to see the sunrise. The first part of the trek is a 2 hrs. 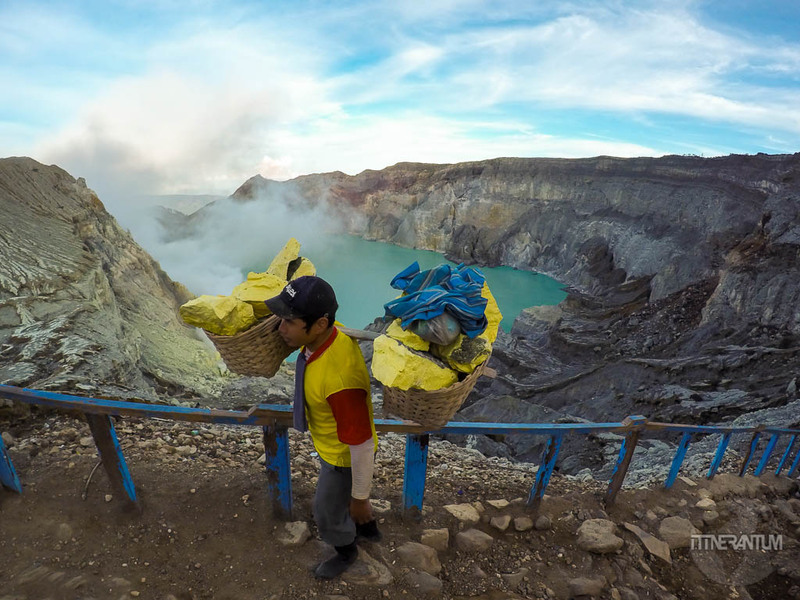 trek from 1800m to 2400m at the rim of the crater. You will start with 2 km of steep climb on gravel and sand, quite slippery path, followed by a relatively flat ground to the crater rim. Remember that all this walking is done in complete darkness. Getting down to the crater is a little treacherous. There is a rocky, narrow, slippery path used by the miners but you need to be very careful as you can easily lose your footing. Also, quite often you have to step to the side of the path in order to allow the fully loaded miners to pass. Remember to always give way to the miners. They carry loads between 70-90 kg, and believe me, I couldn’t lift one of the ground. Their life is hard enough as it is, you don’t need to make it any harder by getting in their way. The sulfuric fumes are no joke. Before starting our descent, we saw a sign forbidding tourists to go down the path. Of course, everyone ignored it, but it makes you wonder. Don’t listen to anyone telling you a paper face mask will do. We had proper “Breaking Bad” type masks and sometimes had trouble breathing and felt a burning sensation down the throat. It’s all down to the weather conditions when you’re down there close to the vents. If the wind changes direction, which it did several times while we were there, the fumes quickly become overwhelming. You have to close your eyes, press your mask harder against your face and try to breathe as slowly as you can. Turn your back to the fumes and keep your head low. Whatever you do, DON’T PANIC. The pale of fumes will pass soon enough. You don’t necessarily need a guide for any of the treks. You can always follow a group with a guide. As long as you have a good headlamp you’ll be fine. You’ll be surrounded by people at all times. All things considered, even though a bit hesitant at the beginning, we decided that going down to see the blue fire is a once in a lifetime experience and it’s worth adventuring for. Now, looking back, we couldn’t have chosen better. Even if apparently it was a “low activity day”, the sight of the flames is breathtaking. Some people manage to see huge flames, others can’t see a thing because of the smoke. We consider ourselves lucky. 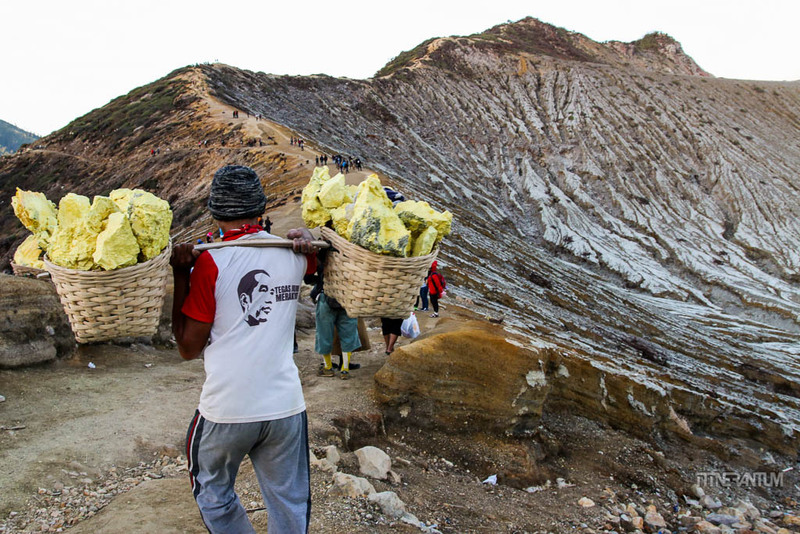 The mining technique at Kawah Ijien is very traditional and basic. 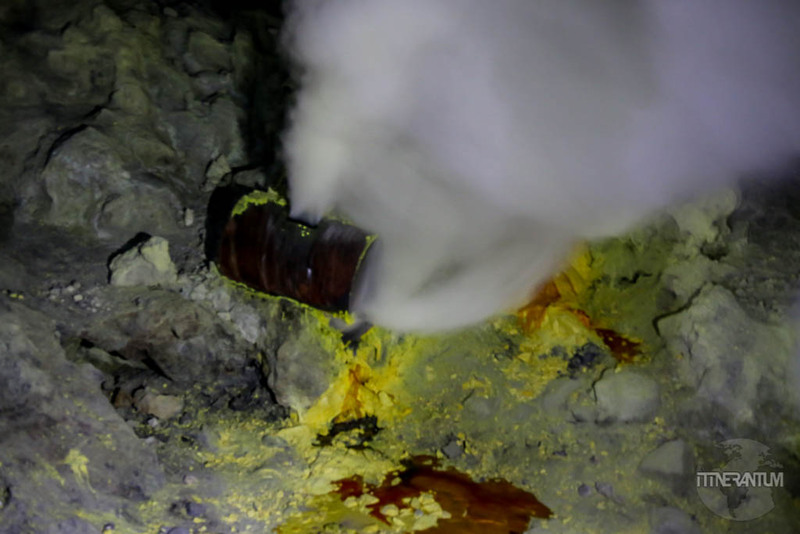 The sulfur gas is channeled through special pipes, cooled with water which helps it condense into molten sulfur. This will solidify in contact with air, resulting in the deep yellow material. 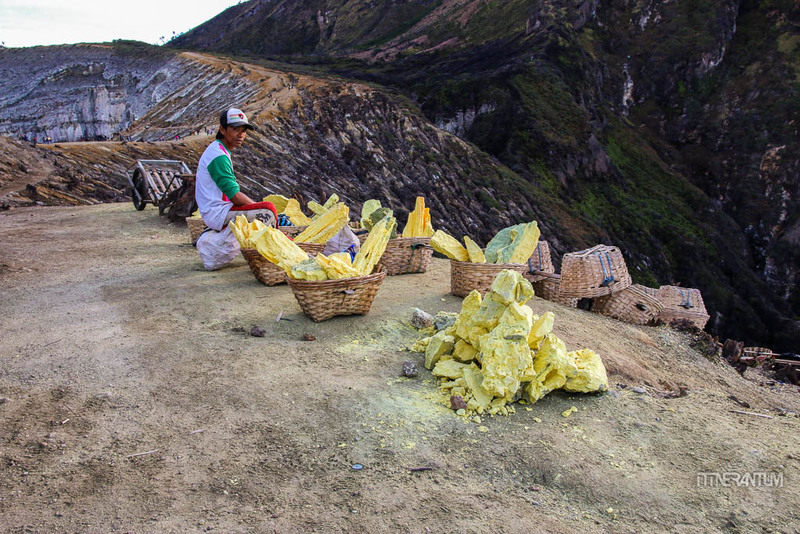 The miners harvest the cooled sulfur and break it into chunks to fill up their baskets. You cannot fully understand how impossible their work is, until you go to your gym, put 80kg on a bar and then lift it up to one shoulder and try climbing some stairs. You probably wouldn’t pass the lifting part. They do all that while breathing that toxic gas (sulfur dioxide), with no mask on. Almost half a kilometer to the crater rim and then 3 more kilometers to the gate. The miners are only allowed to do this journey twice a day. They get paid somewhere around 8 USD for a load so about 15 USD a day. When you see the hostile conditions these miners work in and the health hazard, the amount seems ridiculous. That is why it would be nice to have some chocolate, crackers or bars, and some cigarettes to offer them when you take their picture. Maybe buy one their sculpture. Also, if you wear any clothes, shoes or other protective gear that don’t need anymore, you can donate it to them when you leave. 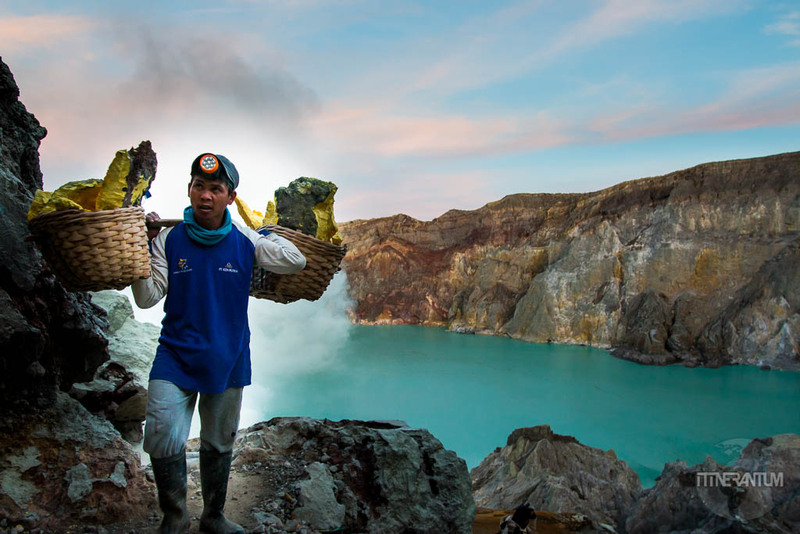 The miners from Kawah Ijien have “one of the worst jobs on Earth”. So do spare a thought for them. 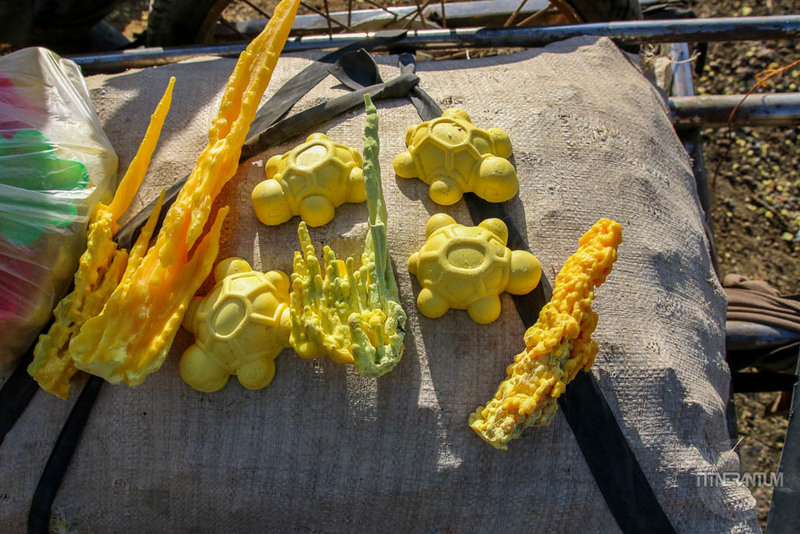 Sulfur in the shape of stalactites, as a result of liquid sulfur dripping from the pipes. And some sculptures made for tourists. On our way up, with the help of the first rays of light and we were finally able to see the surroundings. 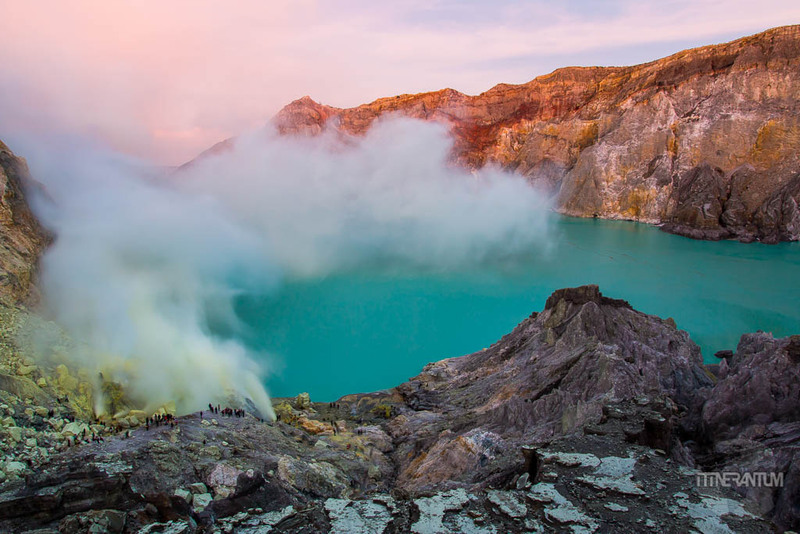 The acid lake started to appear, partially covered with smoke, but its turquoise vivid color and the whole area revealed itself as a completely surreal picture. We stopped for a while at a viewing point to see the sunrise. Once on the rim, it was an easy descent back to car park. Wear comfortable hiking shoes with good grip, a pair that you used before so you’ll avoid getting blisters. I saw people in Converse or even slippers. Buy a good mask with a filter and not the thin “doctor” type mask. You can get one from big shops for around 5$. Or ask your guide to provide one for you. There is no way you can breathe without one if the wind blows the smoke in your direction, especially if you want to get close to the flames. If for some reason you don’t find one, a wet towel or scarf over your paper mask will help. Make sure you get a good headlamp. This way your hands will be free to lean on the rocks or to keep your balance. The flash from your phone is not a proper torch. Most of this trek is done in complete darkness. Wear multi-layer of clothes. You can remove some if you get too hot. A light wind/waterproof jacket is mandatory. Carry enough water. You will also need it to wash your eyes in case they get itchy from the sulfur. Also, a snack would be good, even though we had our breakfast back at the car. Have small cash with you either to tip the miners if they pose to you or buy some sculptures from them. We crossed Java all the way from Jakarta to Banyuwangi to the East. 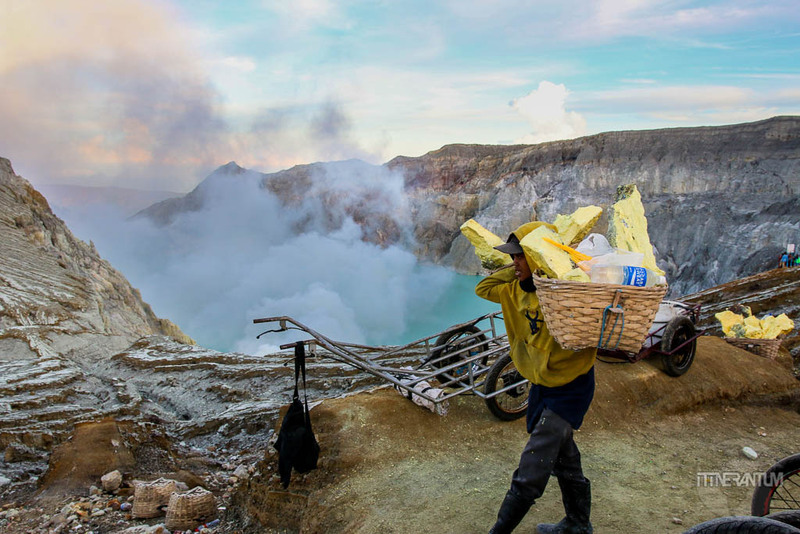 Once in Malang, we booked a 2-day tour with Bromo Holidays (Malang Tourist Information Center). 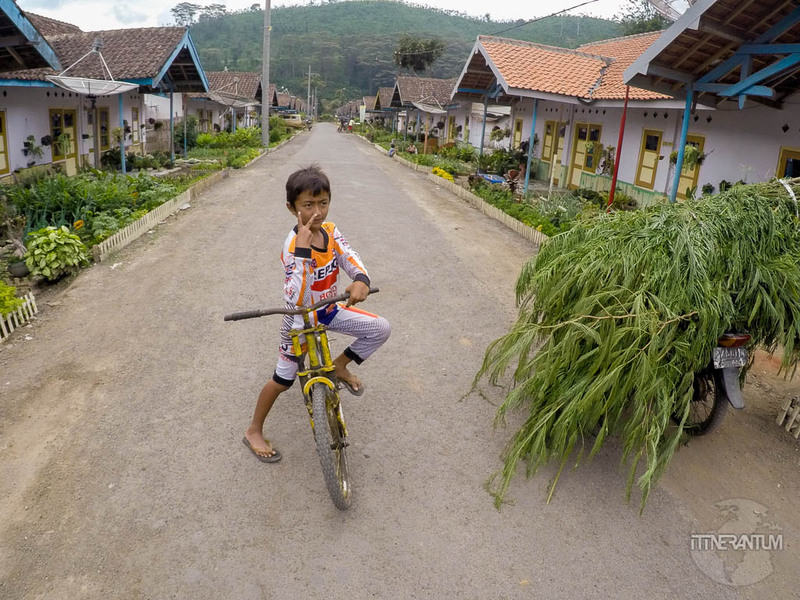 After hearing and reading so many bad experiences and horror stories about people being scammed by everybody in Probolinggo, the main town used by tourists to do Mt. Bromo and Mt. Ijen, we decided we don’t want to be anywhere near. That is why we chose Malang as our base for getting a tour. Like I said earlier, we were dropped off at the ferry terminal to cross to Bali and we didn’t have to worry about anything. They provided accommodation, breakfast, guiding for the two treks, renting of a jeep for Mt Bromo, masks, fees and even the ferry tickets. We paid 200$ in total for this private tour. Maybe you’ll find it a bit expensive but it gave us two extra days to spend in Bali plus the worry free and safety feeling throughout the trip. I think it was the best choice. Of course, if you’re not pressured by time and you feel adventurous, you can totally do it on your own. Otherwise, if you’re already in Bondowoso, you can take a bus to Sempol and arrange it from there. Or you can rent a scooter for a day (around 5-7$) and find your way with google maps to the entrance. We’ve done this kind of trips in other places and it’s quite an adventure. First, you will need to get to the ferry terminal by taking a bus from Ubung Bus Terminal near Denpasar. 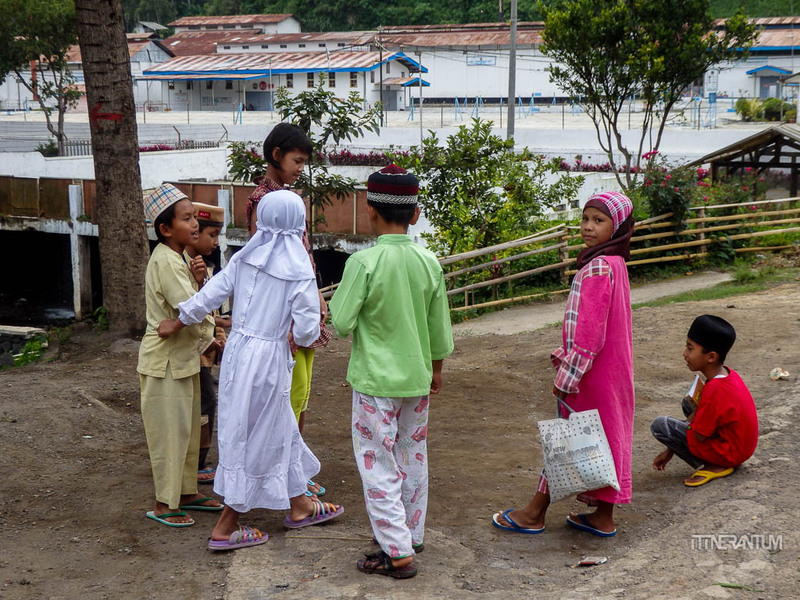 Then, catch the ferry from Gilimanuk to Ketapang and at the harbor, take a bemo to Banyuwangi. Not many choices, I’m afraid. 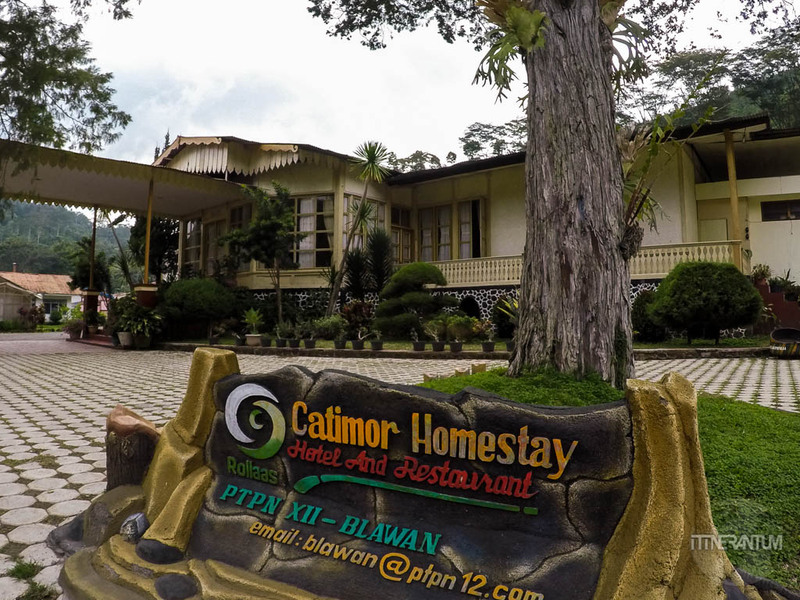 We were put in Catimor Homestay the other option being Arabica Homestay. They are both very basic to say at least but you are there only for a few hours. At least the surroundings at Catimor are really nice. 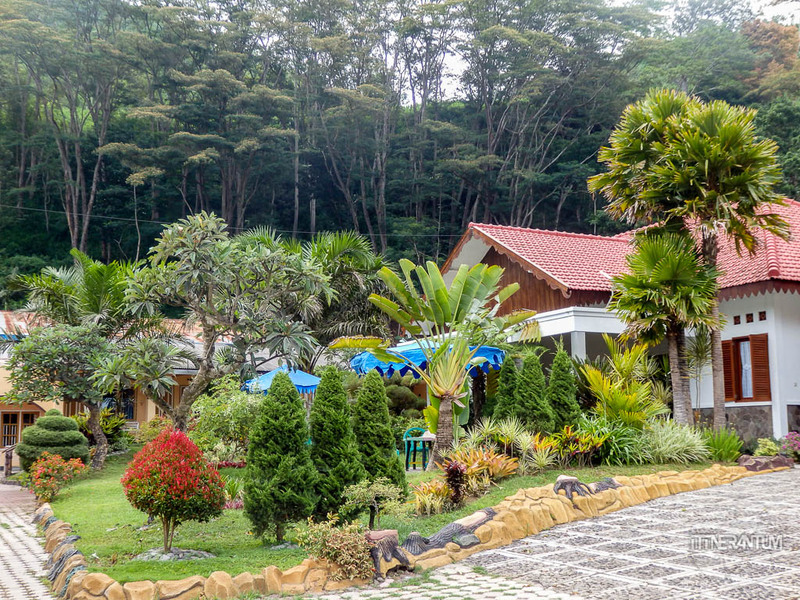 Catimor is located in the middle of a coffee plantation. The dutch built a coffee factory (still operational during the season) here in 1895 and an administration house which is now part of Catimor Homestay. The grounds look nice but the rooms are small and sad. For dinner, we had to order a set menu out of 3 options but we barely touched it. Good thing we had some chips and crackers in our bags. It’s been an amazing adventure, one I’m sure will stay with us for a long time. 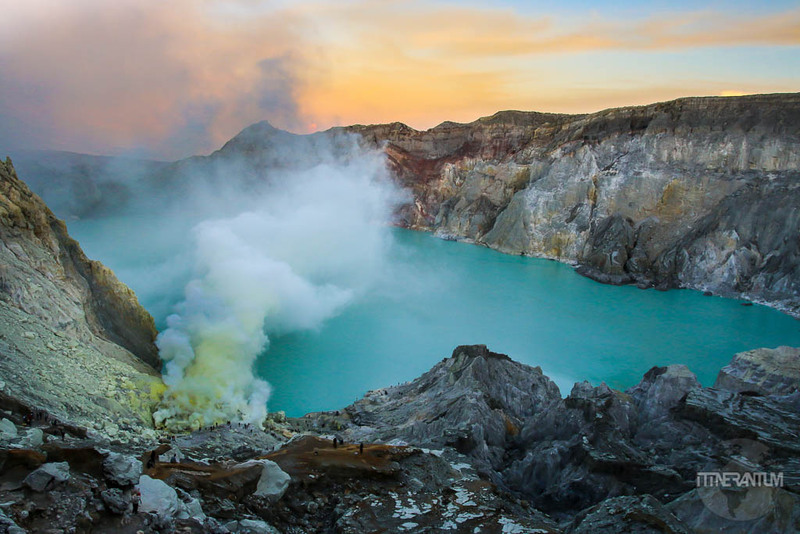 I really hope that after reading this and seeing how spectacular nature can be, you will not miss seeing the Mount Ijen blue fire while visiting Java or Bali. 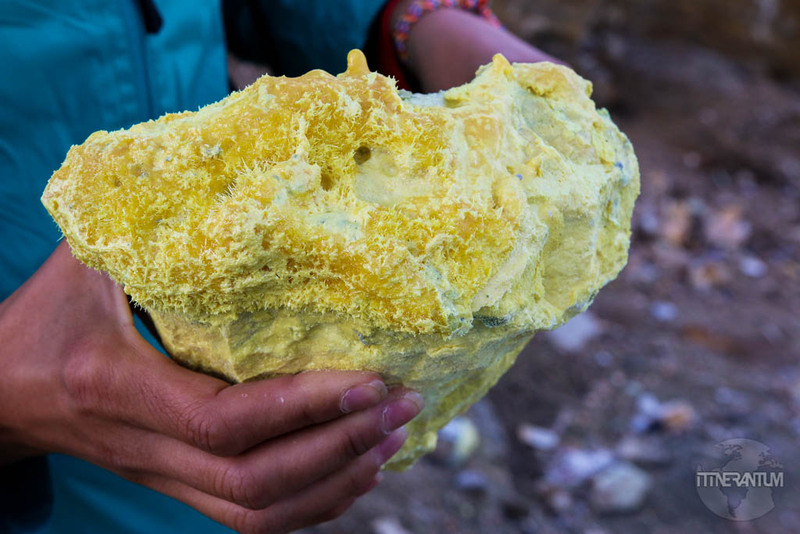 Remember there are only two places in the world where you can experience such a phenomenon, the other one being Dallol volcano in Danakil Depression, Ethiopia. Woah! 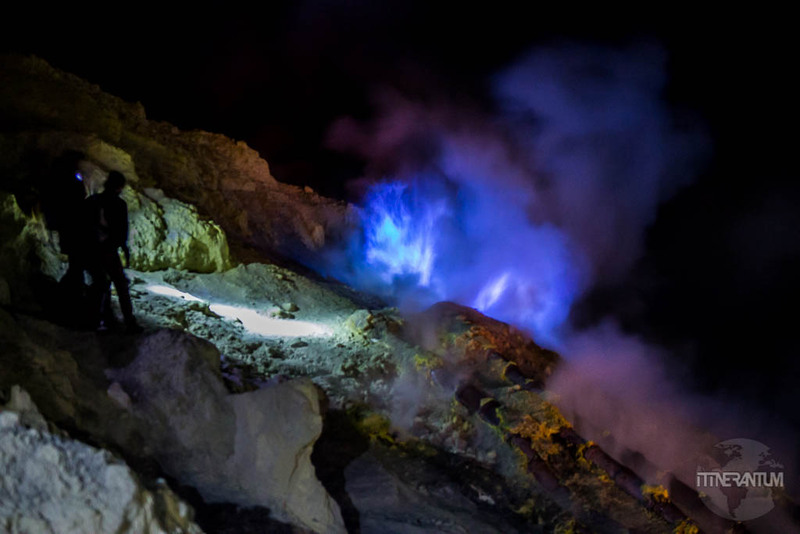 blue flames – i’ve never ever heard about these but it looks so very fascinating. Funny how the bribing for taking pictures is spreading aruond the world. In Peru everyone was asking for a few soles as well. Then again it’s only fair. Here in Germany you can only take some1 pictures if you contacted a lawyer first (or so it seems).